Our system sifts through biotech companies, analyzing them on a variety of criteria, and eliminating ideas which don’t pass the parameters. The focus is on stocks that can potentially deliver strong gains. Eventually, we end up with a ranking structure for a pool of ideas, which best exemplify our risk and reward considerations. The key to success is the Discipline to pursue a system over time. Wealth-building requires Patience. We give room for the system to work. Patience is of paramount importance when following any investment strategy or system that you have confidence in. We judge our system over the long-term (3+ years) and not fixate on short-term monthly performance. Just as a plant takes time to grow into a tree, so does a portfolio as it accumulates and grows its gains over the years. Through a combination of Prudence and Patience, we are able to deliver market-beating Performance. 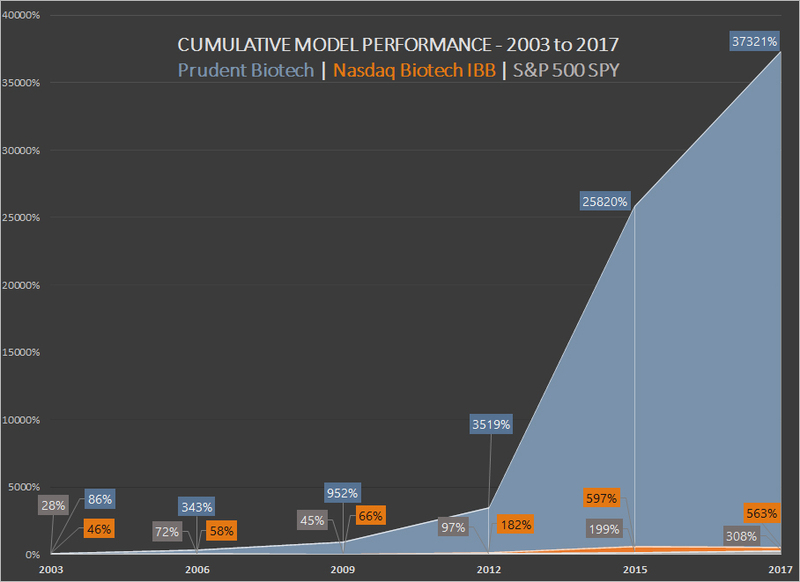 Biotech is a sector of both great promise and great volatility. We follow our system with great discipline. This allows us to, first, prudently position the portfolio in the strongest names, and second, patiently let the system deliver. By combining Prudence and Patience, we aim to achieve consistency of Performance. I find this very helpful. The performance has been quite attractive, and I'm not interrupting my practice to frequently monitor the portfolio or doing broker research. Would You Like A FREE Monthly Biotech Stock Pick? This is discipline. I was trading actively, but kept hurting. Now in this portfolio I trade monthly. I've to teach myself to stop fiddling with my trades, and I'm much better off. Get A Bonus Book As Well! Instant access to our Members Only current and recent issues. The edition has our recommended portfolio for the month, clearly laid out for subscribers. Simply keep track of the guidance at the beginning of the month, and then you're done for the month. No need to track ideas daily. This product is particularly suitable for millennial and DIY investors who wish to be relatively active managers of their portfolio, without the time-consuming daily follow-ups and constant research. Remember, that the portfolio represents access to a quantitative model-based investing methodology. If you're tired of Buy-and-Hope investing, and believe in the merits of systematic, emotionless investing, then our approach is something you should consider. Remember patience and discipline are the bedrocks of a successful investment strategy. Learn more on our Newsletter page. We have worked hard in creating a quality product. You decide on the best subscription deal that works for you. But we realize, that once you make the choice you may like to have the flexibility of a no-risk refund period. You got it! If for any reason you wish for a refund, you can decide comfortably over the next 2 months. Yes, a 60-day full money-back guarantee, with no questions asked. We believe you won't need it, but it's there for you. 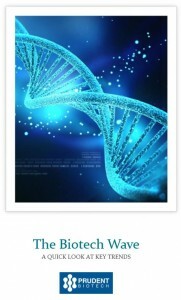 The eBook quickly explains the forces driving the biotechnology sector, and why we should consider investing in biotechnology companies. The book is yours to keep and share even if you decide to cancel the subscription. Graycell Advisors, and its affiliates, officers, employees, families, and all other related parties, collectively referred to as ‘Graycell Advisors’ and/or ‘we,’ is a publisher of financial information, such as the Prudent Biotech newsletter. Historical performance figures provided are hypothetical, unaudited and prepared by us, based on our proprietary analysis and system performance, back-tested over an extended period of time. The performance results obtained are intended for illustrative purposes only. Past performance is not indicative of future results, which may vary. All stock and related investments have a degree of risk, which can result in significant or total loss. In addition, biotech sector is characterized by much higher risk and volatility than the general stock market. Information contained herein does not constitute a personal recommendation or takes into account the particular investment objectives, financial situations, or needs of individual investors. If you decide to invest in any of the stocks of the companies mentioned in the newsletters, samples, alerts, etc., sent to you or available on our websites, you can and may lose some or all of your investment. You alone are responsible for your own investment decisions. We are not liable nor do we assume any responsibility for losses incurred as a result of any information provided or not provided or not made available in a timely manner, herein or on our website or using any other medium. We also cannot guarantee the accuracy and completeness of any information furnished by us. Graycell is not a registered investment advisor and nothing contained in any materials should be construed as a recommendation to buy or sell securities. We may or may not already have existing positions in the stocks mentioned in our reports. Our models are proprietary and/or licensed, and can be changed or revised based on our discretion at any time without any notification. Subscribers and investors should always conduct their own due diligence with any potential investment, and consider obtaining professional advice before making an investment decision.